For the Post Graduates finding the right job is very crucial. But getting that perfect job according to the qualification is not easy. Under the employment schemes of the government of India releases many jobs in different organizations that are well paid. The Chekrs is dedicated to providing Latest Govt Jobs for Postgraduates and the best Upcoming Govt Jobs for Postgraduates. Though there is no lack of Govt Jobs for Postgraduates released regularly but the right resources for spreading the announcement are not there. Coming up as the pool of resource, Chekrs is updated every day with new Post Graduate Govt Jobs 2019 and its complete relevant information. 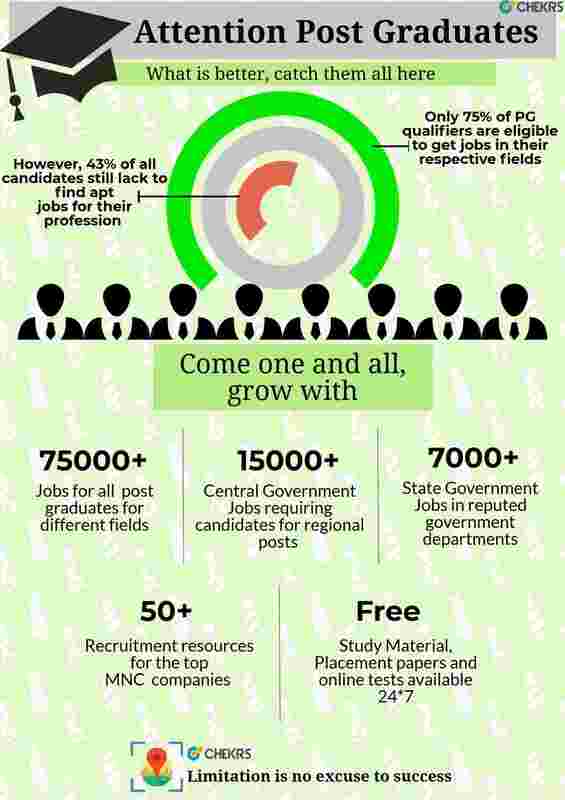 Here the self-driven candidates are exposed to best of the Railway Jobs for Postgraduate, Defence Jobs for Postgraduates, Banking Jobs for Postgraduates, Post Graduate Jobs in Indian Army and all other prominent sectors which promises career growth. Whether you are a fresher or experienced there is always the right option available according to the skills you own. Not only the SSC Jobs for Postgraduate, but many government institutions offering Central Govt Jobs for Postgraduates are there which should not be missed. Regardless of the streams, you belong from we offer you the facility to filter Post Graduate Govt Jobs in Karnataka, Chennai, Bangalore, and all other state options. Why Chekrs is Only Solution? Here it is not just a Government Jobs for Postgraduates search tool but here you can get all minute information which is required right from the application submission to the exam or the recruitment test. Along with it helping aids are also provided such as the study material and specialized Post Graduate Govt Jobs test series to bring the best out of your efforts. How Chekrs team can help you? Whatever confusion you have, Chekrs team is always just a step ahead to help you. Whether it is to get additional help in Jobs for Post Graduate Fresher or information regarding its progress, we have a solution to it. To receive the updates for Post Graduate Jobs 2019 all you need is to subscribe jobs.chekrs.com and stay updated every day.